"From 1616 to 1618, Johannes Bureus produced no less than three Rosicrucian pamphlets building up to his claim about the secret of the Runes and their Gothic past. The first of these, the Ara Foederis Therapici F.X.R. Assertioni Fratemitatis RC quam Roseae Crucis vocant, consecrata. Hoc lege, perlecto Carmine certis eris (n.p. 1616), was a brief addition to a reprinted text in verse produced at Hagenau in 1614. 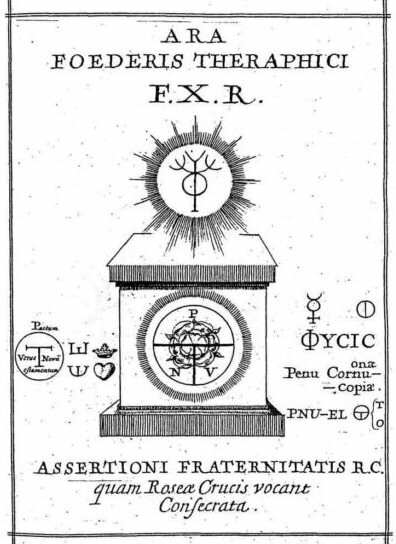 The frontispiece shows an altar inscribed with a rose and a tau set within a circle, thus creating the sign of vitriol, the green salt from which the process of alchemy can begin, a salt that'Paracelsus calls the Signat-stem." 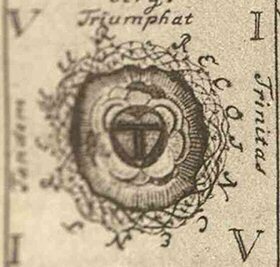 The connection with Rosicrucian thought is already clear from the date underneath the column on the left, which shows a rose with the initial ‘T’ in the middle and the word 'recoincentremur’. The initial ‘T’ stands for the book of the same initial which according to the Fama was found in the hands of Christian Rosenkreuz at the opening of the tomb.. But it sounds like it was a callback to his friend Bureus' frontispiece. Well, I found it.. or at least a reproduction of it. Now that I have it, when I do a reverse image search on it, nothing comes up.